If you've been coming to this blog for any length of time, you know at least a little about Fragile Dreams: Farewell Ruins of the Moon. 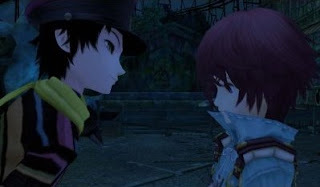 "During the course of the game, the central character [Seto] will encounter another wandering survivor of the apocalypse: one of their meetings involves a prolonged, deep kiss, which surprises and unnerves Seto ('But that was my first kiss ever!') but leaves the older fellow nonplussed ('Well then, I guess that makes me your number one buddy')." Hm. I'm interested to see the context for this kiss. As it stands right now, it sort of sounds like it's a little creepy. I certainly hope it's not presented in that light.